I really enjoyed Avengers: Infinity War. Okay, it's not my favorite all time MCU outing, but it was well above the average, and it did a nice job of creating interest in the several next upcoming films. 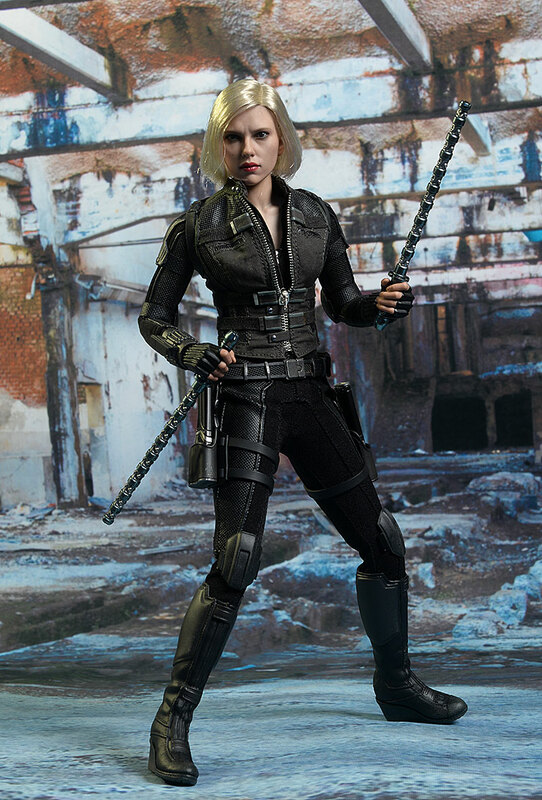 But as much as I liked the movie, I didn't buy all the Hot Toys releases. I'm going to be honest - I'm getting more and more worn out by the re-release of the same dozen characters. I'm even growing weary of Guardians, of which there's only been a couple each so far. But that doesn't mean I skipped them all. I felt several were unique enough to warrant my attention, and one of those is the platinum blonde Black Widow. She's been shipping for the last couple weeks now, and will run you around $220 at most retailers. Nothing too new here. It's a slip cover over a window box, with some reasonable graphics. Of course, it's all collector friendly, and the single plastic tray inside keeps everything safe and sound. I did feel the tight plastic wrap mats the hair down more than necessary, but it's a minor nit overall. Of course this is a new sculpt, but it's the bright hair that really sets her apart from the earlier releases. 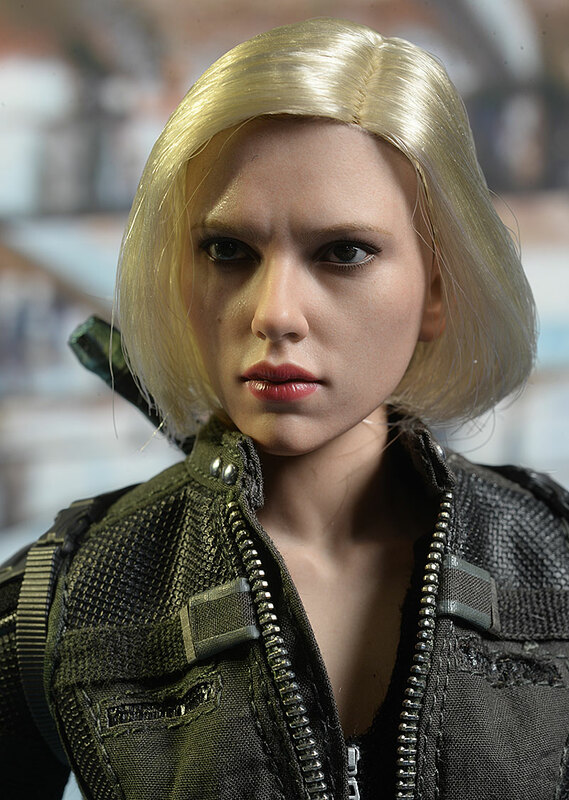 The face is uber realistic, as you expect with any Hot Toys portrait. The subtle skin texture, fine lines around the eyes, and texturing on the lips and eyebrows looks terrific. It's definitely ScarJo, and the eyes, nose, and lips hit the accuracy mark. She has a serious, slightly stern expression, with the appropriate wrinkles to convey her current emotional state. It's a game face - serious, but not over the top. This time around I'm torn on the rooted hair. I feel it works great with longer hair styles, and is really necessary to create a more realistic look. There's plenty of strands here, with no bald spots or obvious roots at the hair line. They even add a little shadow line along the hair line, to add some depth and realism. But with short hair, I'm not sure it's always the best direction to go. Hot Toys sculptors are capable of very realistic, very detailed short hair, and I suspect they could have nailed this style all in plastic. The bigger issue would have been in the next category, because getting a blonde look that doesn't scream 'paint job' is really hard. Of course, you can get out the hair product and work with the lines a bit yourself. You'll need to, since right out of the package the hair is quite flat and matted down. The more I worked with it the happier I was, but I'm not completely sold on going with rooted hair this time. 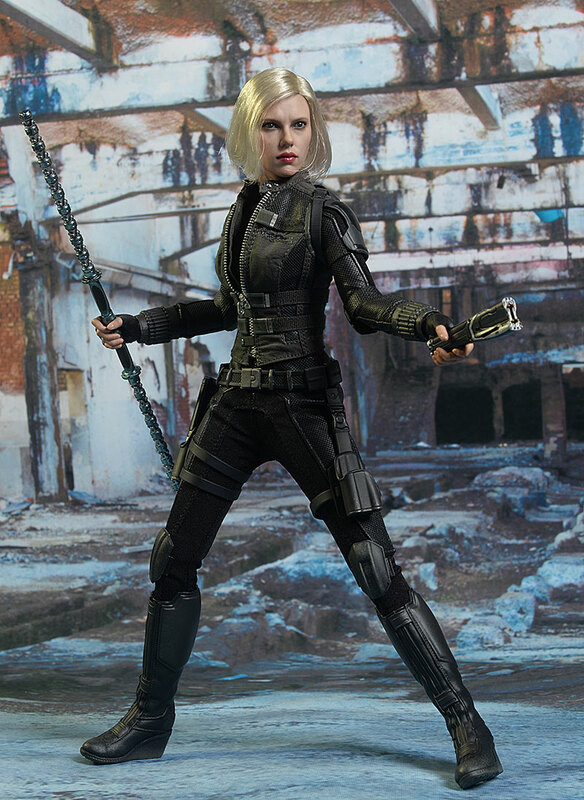 Black Widow stands just under 11" tall, about right to fit in with the rest of the Hot Toys Avengers. 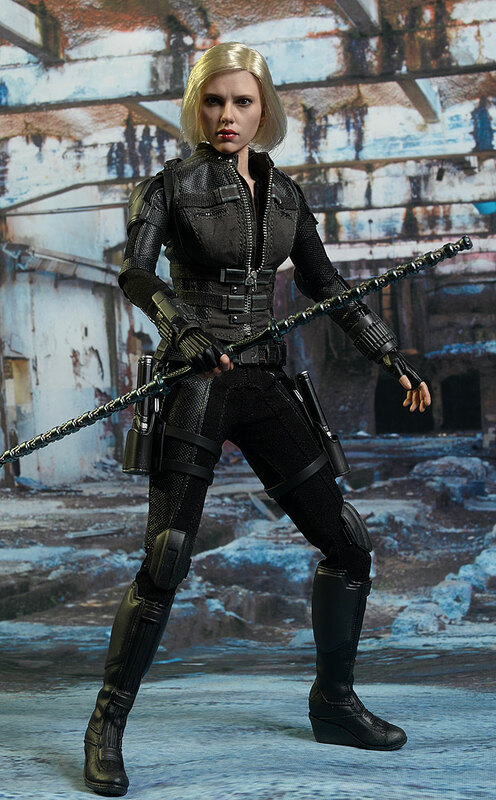 This is a Hot Toys paint job, and you expect exceptional quality. You won't be disappointed. The eyes are fairly clean, but there's a little bleed around the edges of the whites. They are aligned with each other properly, and the mascara and eyelashes look good. The soft eyebrows have just enough color to look realistic, and the bright lips are even and clean. The skin tone has just the right amount of variation, and it matches the neck and torso well. The bright blonde color of the hair is very good, and is an area where rooted hair - long or short - has a definite advantage over painted plastic sculpted hair. I did pull a half star though, thanks to the shadow line between the lips. They usually go with a black line through the center, but this time it's a bit more obvious. Perhaps it's the contrast of black against the red lips, or maybe I'm just getting sensitive to it. This is not a super poseable figure, thanks to a couple key shortcomings. The neck is fairly stiff, so even with the rooted hair, you won't get a ton of tilt and lean. The shoulders, elbows and wrists work great though, allowing for plenty of nice arm poses. The torso can lean and turn a bit, even in the tight fitting vest, and the hips and knees work well despite the tight suit. But the solid, hard plastic boots completely remove any ankle mobility, making anything other than short stances tough. The feet won't be flat on the ground, making wider stances look less realistic and clean. I had another big issue in this category - I snapped a wrist peg. 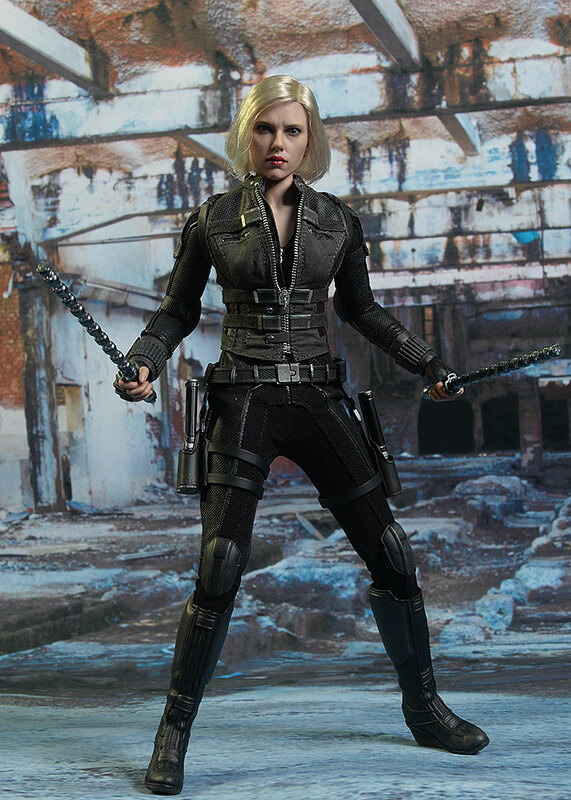 That hasn't happened in a long time with a Hot Toys figure for me, but her right wrist snapped while I was barely moving the hand in a pose. They supply a couple extras for just such an emergency, but digging the tiny post out of the hand without damaging the sculpted glove can be tricky. Considering the price point, there's not a ton of goodies here. She has three extra sets of hands to go with the relaxed palms she comes wearing. 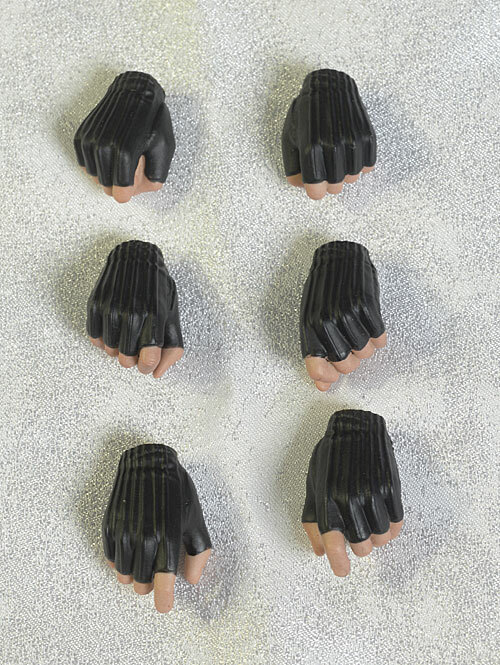 There's a set of fists, a set of gun grips, and a set of tight grips. They work well with the various accessories, and swapping them wasn't difficult. They also stayed in place while posing, although I did snap the one wrist peg, as I mentioned earlier. 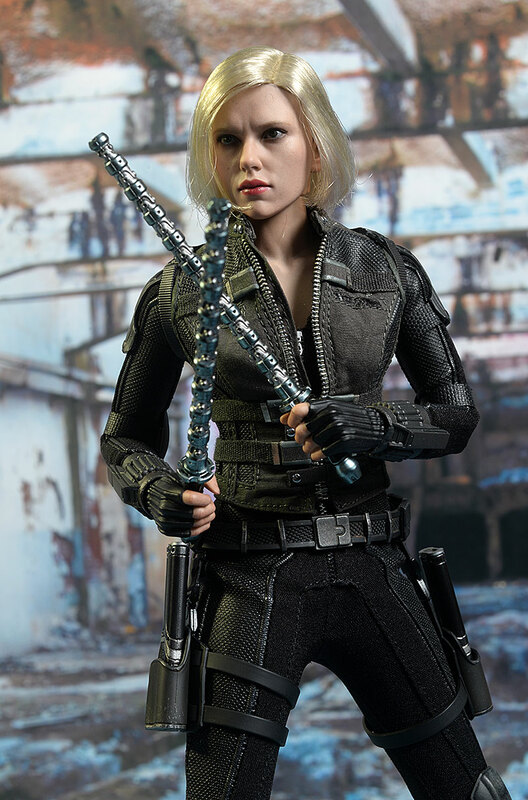 She also has her weapons from the film. Rather than go with two short batons that attach to make one long staff, they went with providing two shorts and one long as separate items. They look great, and fit neatly in the provided hands. 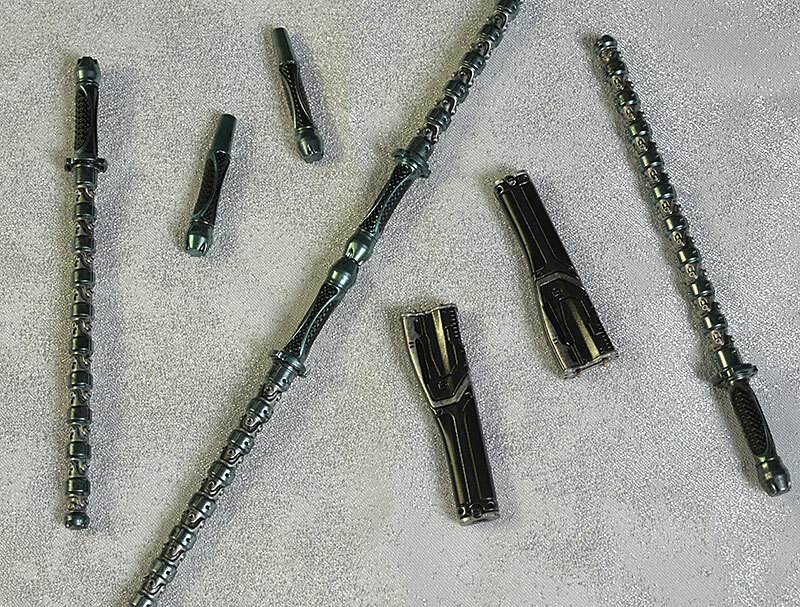 Those batons are supposed to be drawn from her backpack, so they provide two short handles to slip into the top of the pack to simulate the look. 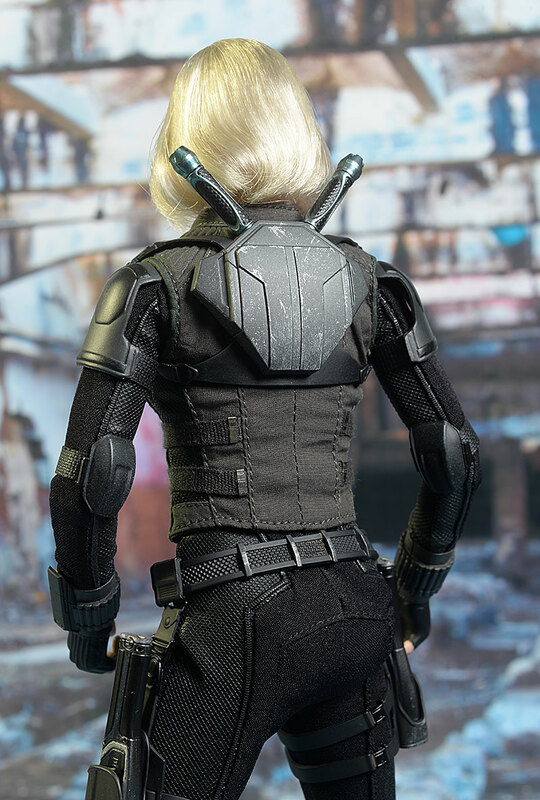 And of course she has the two 'disc shooters', which fit tightly in the holsters on her belt. She can also hold these in the gun grips. While the sculpts and paint work on these is good, this is all there is. Sure, there's the standard display stand with support rod too, but considering the price point, she's pretty light in this category. The outfit is extremely well tailored, including the outer vest and underlying body suit. The straps and belts look great and fit neatly, and the backpack - which is not removable - fits the two baton handles perfectly. There's some wear and tear on the pack, giving her a battle worn appearance. There's a variety of pads and smaller armor pieces, and some - like the elbow pads - can be adjusted around. Had they done a little better job with the boots, this would have been a four star outfit. But the solid, tall one piece boots take away all the ankle movement. I much prefer a two piece design, or at least a softer material, either of which they could have managed to do here. The reduced articulation hurts this score a bit too, as does the lack of many accessories. I'm betting you find a pose you like, and you stick with it long term. There won't be a lot of posing and re-posing on this one, taking away most of the fun. While I have a few nits, the price point of $220 seems about right for the license, character, and resulting figure. She could use a few more accessories of course, but with the complexity of the costume, it still supports the asking price. I managed to snap a wrist with very, very little force, so take some care this time. Hopefully I just got a bad one, because the post I swapped in worked great through multiple hand swaps. I think I'm getting weary of just about all the Marvel releases. 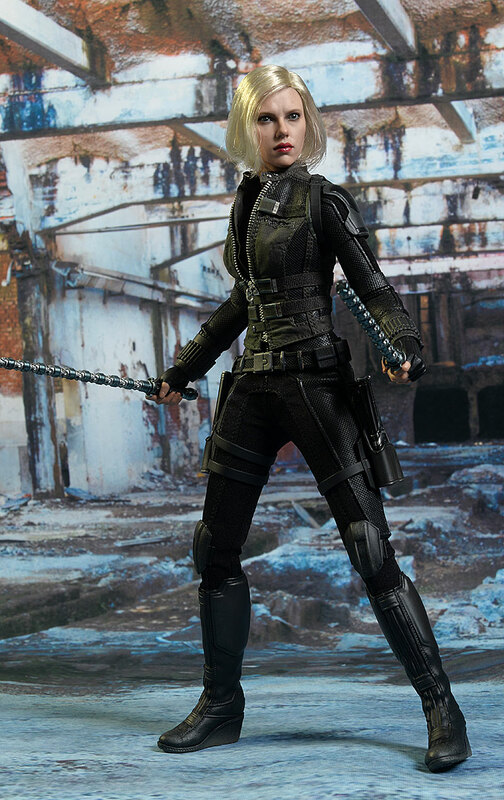 It's not the fault of Hot Toys, but you can only milk this particular cow for so long. 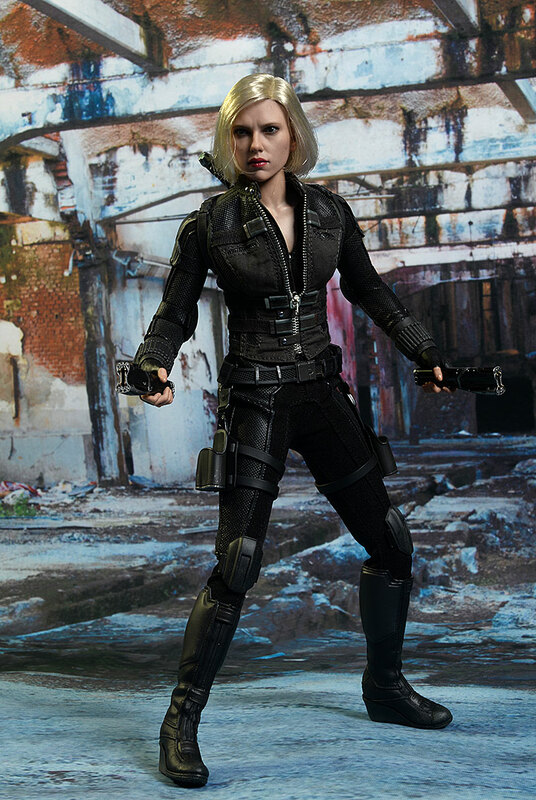 Still, I needed the light blonde look for ScarJo on my shelf to go with the darker and red versions we've seen in the past. The costume changes are also notable, so she won't blend in with the pack. 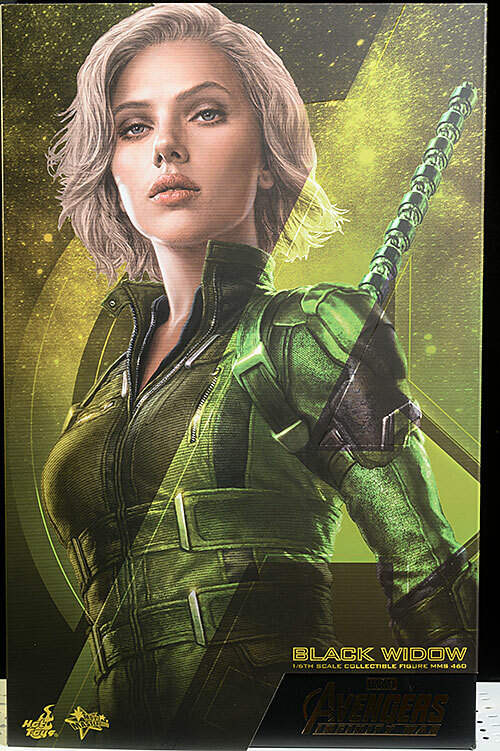 I'm not sure I'll be getting another Black Widow from them in my lifetime, but this one is a reasonable addition to the Avengers line up. - has her for $220. 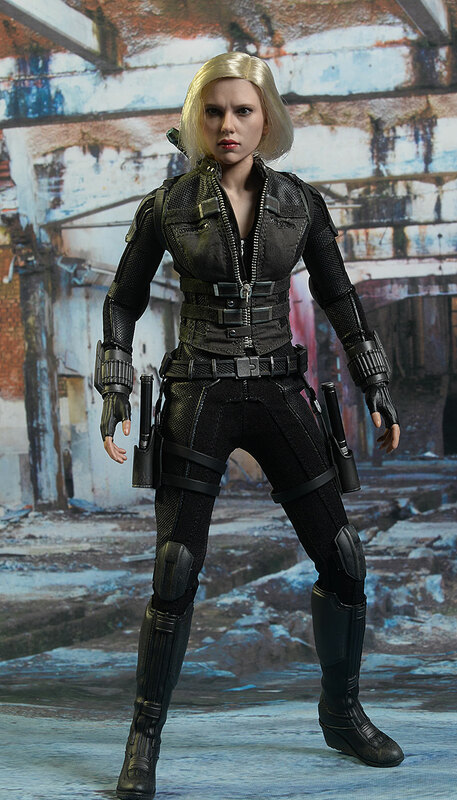 - Sideshow has her for $220 as well. 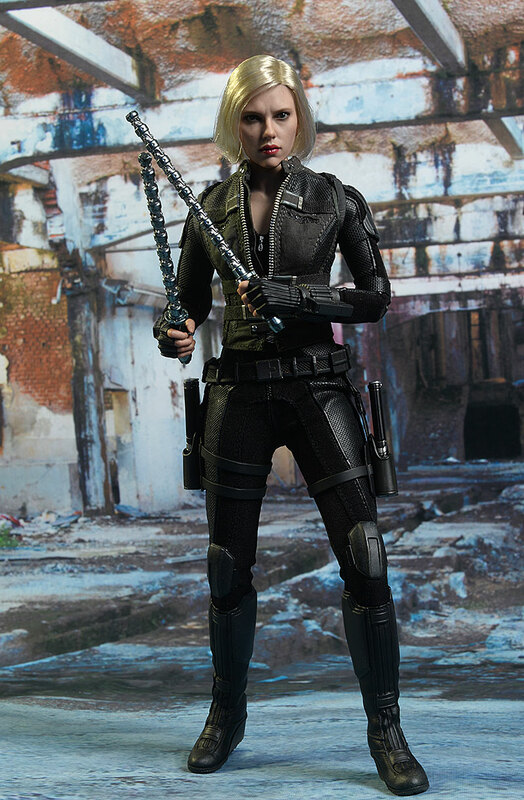 Other Hot Toys Black Widow figures include their first, along with the first Avengers release.